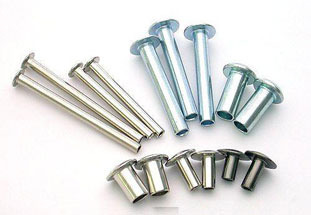 We at BM Industries also manufacture rivets based on the customers requirements. We happen to be one of the elite few having the machinery and expertise to manufacture High Tensile rivets used primarily in clutch systems. B.M.INDUSTRIES, an ISO 9001:2008 certified company was founded in 1973 by the proprietor himself and an installed furnace to make Aluminum ingots and Shots, which was being supplied to nearby steel plants. BMI later on diversified into Fastener industry with a dream and determination of providing all its customers with world-class products. With only 1 Header and 1 trimming and rolling machine the company today has major production facilities for producing fasteners up to 20 mm Diameter & 10” in Length. Headers: 2 multi-station headers and 7 fully automated cold forging machine headers. Threaders: 6 automated thread rolling machines. Trimmers: 6 automated trimming machines. Lathes: 3 lathe machines and 6 lathe adda's. Fully equipped tool and dye room etc. All the products of the company pass through the strict quality norms. The department is equipped with Thickness gauges, Height Gauge, Vernier caliper, Micrometer, Thread ring Gauges etc along with bank of good experienced employees in the product and quality line.